The last few years I have been getting more requests to "do something" with old furniture pieces, adding ornament, refinishing wood, repairing gilding, etc. I love working on furniture and the special challenges each piece presents. One of the hardest things to work with is bright orange oak --- a tough one because of the assertive grain among other issues. Oh yes, you can fill it and paint it, but why not find a way to work with it? 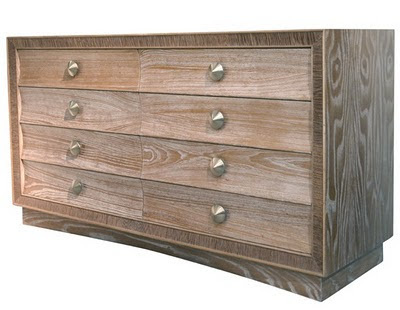 In this age of cheap laminate furniture, solid wood is something to be celebrated! One project I had recently I took my inspiration from a midcentury piece of cerused oak, also known as limed oak. Inspiration: 1943 Paul Frankl limed oak dresser at 1stdibs. In the sixteenth century this finish was created to help deter insects and rot in oak beams and paneling, by filling the grain with lime or lead-white and wax, but after a while it became a fashionable way to lighten up and enhance the the look of the wood. Cerused oak finishes were also fashionable in Art Deco and midcentury interiors for furniture, floors, cabinetry, and paneling, and is now once again very much on trend. Note: I am not talking about the pickled "slimy pink" whitewash that was all the rage in the 1980s. 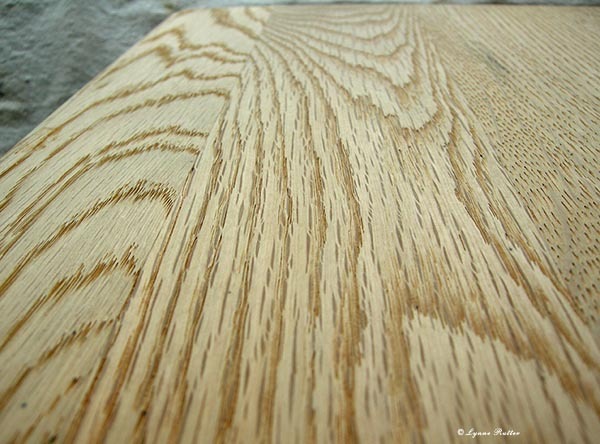 A good cerused finish shows the grain in contrast to the rest of the surface. 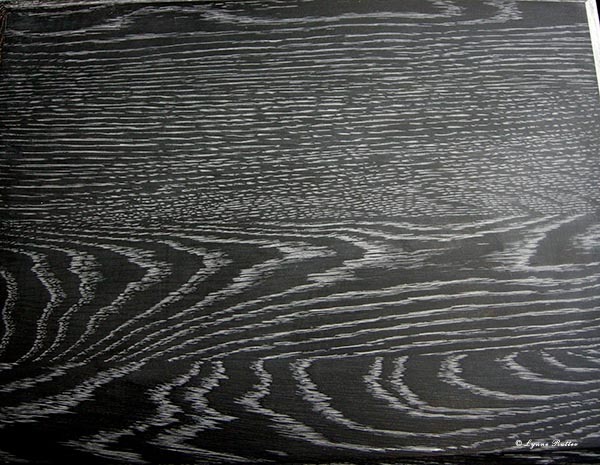 High contrast between the wood and the grain is a really effective look. Please note this is not a technique useful for any kind of soft wood (pine, cedar, redwood, etc.) nor do I advise trying this on any kind of plywood or veneer. 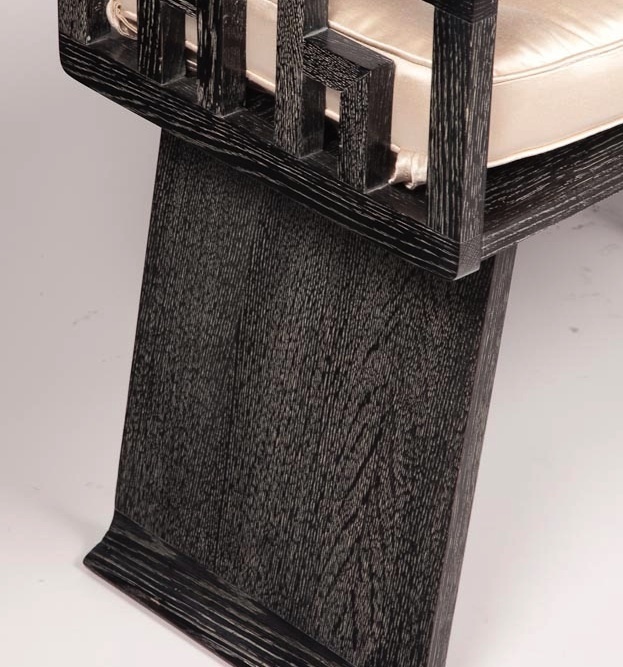 Inspiration: circa 1950 James Mont bench in ebony limed oak. I found many instructionals for liming wood on the internet but none with pictures. I like pictures! So I decided to share the process of transforming this orange varnish oak piece into something more fabulous and moderne looking. First, we need to strip off that varnish. I like Citristrip for this kind of thing. Let it sit for at least a half hour then scrub in the direction of the grain with a stiff stripping pad or brush. 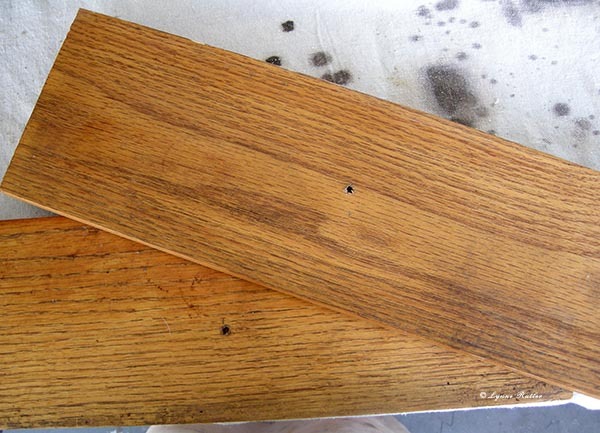 Once you have removed all of the varnish, rinse the wood thoroughly with water. Then, scrub lightly with a brass brush. Brass will not discolor the wood nor be too rough. If you are starting with raw wood, simply get it wet and scrub it a bit to raise the grain. After the wood is dry, lightly sand to smooth out the top, and get all the dust and bits off with steel wool and/or stiff bristle brush. You should then have a very clean oak surface with pronounced grain pattern. Make sure your wood is dry, and let's get some color on it! Do not use "stain." Stain will absorb into the softer parts of the wood more than the rest of it. Instead you want to dye it. 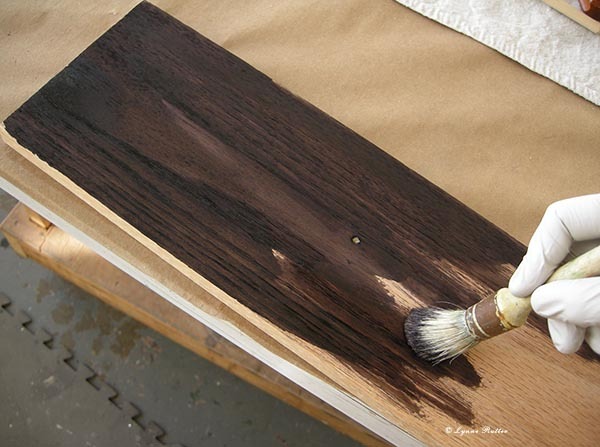 Aniline dye will soak into all the wood evenly without leaving any kind of residue. You may get it in powder form - like raw pigment but much finer ground - to dissolve in water or denatured alcohol. 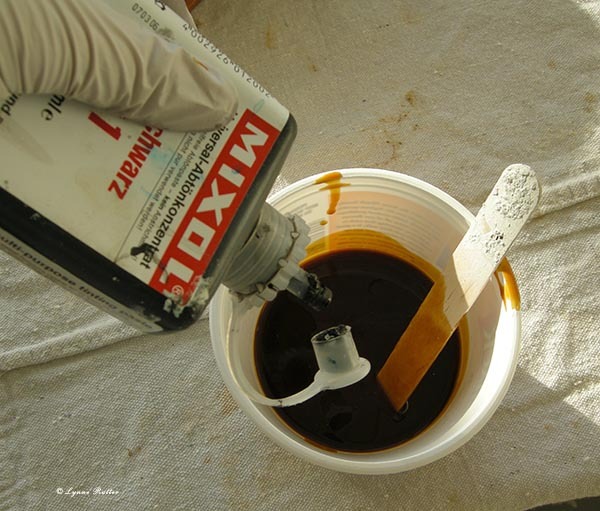 Aniline dyes tend to be opaque looking, leave no lap marks, and dry quickly. There are also pre-mixed "super penetrating" dyes that use acetone as a vehicle and are very effective. If you buy this kind of thing, please read the MSDS carefully, and wear the proper protection. In some cases you need 2 applications if you want to get a good solid color. At this point what we have is an evenly dyed, fairly matte, and absorbent surface. It needs to be sealed mainly to make it a bit slicker, which will make the following steps easier. Shellac is perfect for this as it will not build up or fill the grain, and it dries quickly. And if the shellac is tinted with a drop of black (or the same color as the dye underneath), it will add to the depth of the finish. In addition to keeping the color from migrating into the wax, the shellac makes it easier to lightly wipe the liming off the surface while leaving it in the grain. Remember too much tint will slow the drying time of the shellac and add volume, so use just few drops. Apply one or two thinned coats of shellac to your surface and allow to dry thoroughly. Liming wax is available pre-mixed but I made my own by mixing clear microcrystalline wax and whiting (chalk). You can also use white powdered pigment or lime powder mixed into wax paste. Make sure the wax paste you use is a type that will dry fairly hard. Next we fill the grain with this liming wax. Cover the whole surface, use a liberal amount of liming wax and push it into the grain with steel wool or a soft cloth. Immediately wipe off the excess with a soft cloth. Let dry thoroughly. You can repeat the liming if needed, or go straight to sealing. To seal this finish you need only add another layer or two of clear wax, and buff. Microcrystalline wax is made with low odor mineral spirits and dries quickly and quite hard and impervious. I have achieved this look using paints and acrylic finishes, but I have to say using more traditional materials makes this far easier and the finish has more depth. It feels very smooth to the touch and is quite durable as a furniture finish, and very easy to maintain. You may also try this finish with different colors. And obviously, the nicer the grain of the wood, the more appealing the finish will look. Fantastic. Thank you so much for sharing. This could not be better timed! You just gave me inspiration on how to solve a flooring dilemma in a client's home. They would LOVE this! nice job! so cool to share your tips and materials- thanks! Thank you for sharing--stumbled into your blog this afternoon and it has made my day! Very cool indeed. 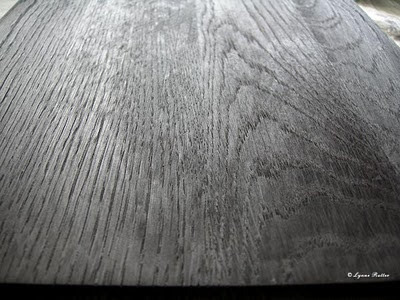 I've spent a lot of time searching for information on this particular finish and could not for the life of me remember the name of the technique, limed-oak. I have two (golden oak veneer)mid-century end tables that need a face-lift. The ebony has a gorgeous finish and is exactly what I am looking for! Thank you so much. Finally a clear concise description of how to achieve this look and with pictures too! I like pictures! I never read instructions without pictures, so someone had to do it! I am so happy that I found your blog. I've been looking for instructions on how to do this. Thank you for showing us pictures too. This is amazing, I've been getting really into inlay and other wood art, and I just know I will find a use for this soon. I'm going to try it out as soon as I get some free shop time. Great pics and instructions! Could I use the liming wax straight on varnished oak? Our kitchen is too dark for that ebony (though the contrast is nice). Trying to embrace the grain and bring our nice oak cabinets into the 21st century. Does the shellac stick alright after the wax and whiting mixture has been applied? No. Shellac is used before applying any wax. Unfortunately I didn't find your page in time. I've been asked by a customer to fabricate some shelves and cabinets with this finish in a dark gray or black. The page I did follow stated using a stain followed up with a liming wax. Well this worked great on the sample oak boards I created but has been an absolute horror show on the actual product I've fabricated. The liming wax has either washed out a lot of the stain, created an inconsistent finish or not even stayed within the grain. Everything I've done has been the same as you've stated with the exception of two points you mentioned, the dye and the shellac. I'm thinking the shellac ought to help in the majority of my problems but I wanted to ask what you thought of the stain already applied. If I lightly sand and the apply a dye to the overall surfaces do you think I will have better base point to continue or do I have a major problem on my hands? The key to having the liming wax stay in the grain, is digging out the grain with the brass brush prior to adding any color. If the wax isn't filling the grain maybe you didn't scrub out enough pulp to raise the wood sufficiently. There are of course other ways to go about this but IMO if you skip steps and then have a problem there is only one solution and that is to get out the brass brushes and clean it up and try again. Hello, Lynne. I followed your excellent instructions and cerused an oak end table that looks great. The problem is that it does not appear to have cured properly. If you touch it with a damp cloth the ebony stain comes off. This is the first time that I have used an aniline dye and I thought it would sink in. I used shellac after the dye, then made a liming wax with chalk paint and wax. I even bought a microcrystalline wax instead of using Annie Sloan. As I said, it looks great just like your pix, but there is obviously something wrong. I have made liming wax before and used it on an oil based stain with no problem. Any suggestions as to what I have done wrong? Hi UWF -- there are a lot of steps here and if anything wasn't dry that may account for this. If the black color is coming up than possibly it was not allowed to dry or maybe there was too much put on, or maybe the shellac was too old, or maybe the "chalk paint" is dissolving what's under it because it is a bit caustic. 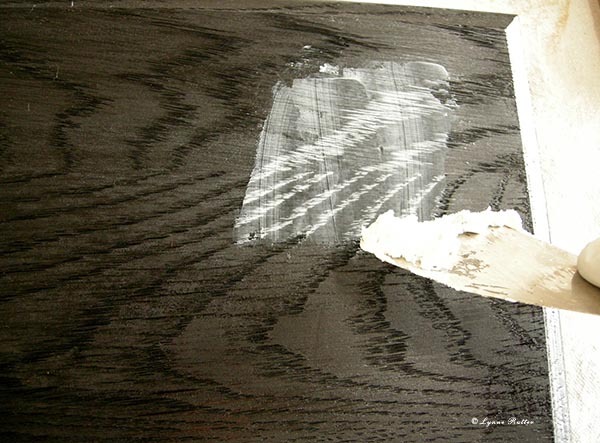 I don't use paint for this finish, I use chalk or whiting mixed with microcrystalline wax. "Chalk paint" is not just chalk, but I can't say exactly what's in the product you bought. I really recommend making samples before committing any finish to an actual piece of furniture, so you can get your process worked out. 1. After achieving the shade of wood I like through dying (using aniline dyes), according to your site I'd shellac the table top with one to two coats of shellac before waxing. 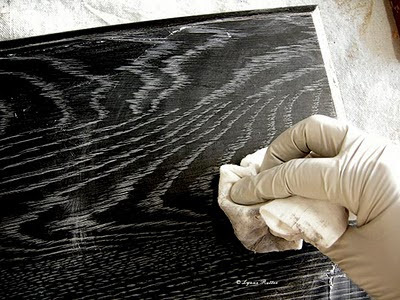 My question is should I attempt to open the grain with a natural bristle brush to prepare the wood to accept the wax? 2. What product are you using to tint the shellac? 3. what brand or type of shellac to you use? I've only used poly products. 4. After waxing and removing is there a product besides clear wax to seal the entire top? I'd like to not worry when I see people not using coasters or spilling drinks on the table. 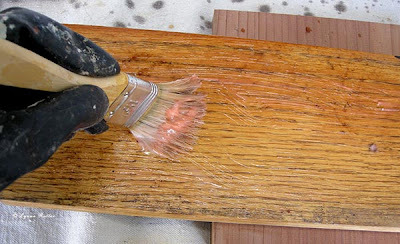 1. open the grain with a brass bristle brush, PRIOR to dying the wood. 2. in this demo I used Mixol tint. You may also use pigment or a dispersion of pigment. This is entirely optional, it's just part of how I do it. 3. I usually make my own shellac (from flakes dissolved in alcohol) but you may buy pre-mixed shellac of various types. "Seal-Coat" by Zinsser is a good de-waxed type of shellac that is easy to find. 4. clear wax is a very good sealer and is easily maintained. You can re-wax the top from time to time with very little effort. If you want to use poly or bar top or something on your kitchen table then you should not use this method to ceruse the oak. As I noted, you can try using other materials to create this effect-- white paint to fill the grain and then varnish with something else and not use wax or shellac at all. You'd have to make samples to see how that comes out. The method I have demonstrated is traditional and easy, but is best suited for those areas where this finish would traditionally be used - on paneling, fine furniture, cabinetry, etc. Thank you for all the great information. I'm trying to familiarize myself with this process and products needed. I'm curious if you know much about the toxicity of these products, aniline dye and microcrystalline wax, the mixol dye as well? I would like to redo my solid oak cabinets, either in ebony or light natural but I have four children I'm trying to protect. The shellac; why do you apply it before the lime wax and will it yellow with time? Thank you so much for your sharing your knowledge! Hi Brian, I recommend reading the post thoroughly about the process and then trying it on samples to understand what to use and in what order. Of course I know a lot about the toxicity of the materials I use, and take precautions accordingly. If you are unsure about what materials or products you have, read the MSDS of any products you buy and to be on the safe side protect your face and hands when handling these materials. Be aware that even "safe" products and materials require some caution when handling, especially around little ones. The comments in this post also have a lot of good info so check out all of them. "In addition to keeping the color from migrating into the wax, the shellac makes it easier to lightly wipe the liming off the surface while leaving it in the grain. " whether the shellac ambers depends on the type of shellac you buy or make. In this case I used an amber shellac but tinted it black. It will not change color but also if you want a colorless shellac then don't buy amber shellac, buy blonde or natural. I am following your instructions on a small oak floor. I am getting ready to apply a second coat of dye. My question is, since this is going to have wear, is there anything different I should do from this point to make it more durable? Or continue with the instructions? Thanks! You'll likely want to try a different process rather than liming with wax, so that you can use a good floor finish on top. I recommend making samples. My tutorial above is for fine furniture, paneling, cabinetry... but I'd not use this exact process for floors. I might try using a coat of varnish over the dye, rubbing some white paint into the grain and then wiping it off quickly, let dry, then topcoat. Hope you are still around and answering because I have not seen any question similar to mine, much less an answer. I have a old (1930-1940) cedar chest properly sanded to a smooth finish. It has knots and pronounced grain. Would your ceruse technique work on this wood or is it limited to oak? What about a soft wood like pine? Thank you very much. Cedar is not a good candidate for a cerused finish. This is a technique traditionally done on oak. Other hard woods with pronounced grains that can be "dug out" in this manner might work (ash, for example.) Soft woods like pine, or cedar, redwood, are too soft to dig out their grain, and the grain is not pronounced enough. Also, I would never do such a finish on any wood with visible knots. Cedar and pine take paint very well, but do not stain well at all. So maybe you should think about a painted finish. I have also revised this post to clarify this point. Hi Steve. Is there a possibility that the shellac is not dry enough and may be fogging? If the shellac is not fresh it can take overnight to dry. Also, a lot of paste waxes you buy have driers in them because most people want them to dry fast. Maybe you cannot get all the wax off because it's too stiff. Your liming wax should feel fluffy and soft when you apply it. Try thinning the wax paste a bit by stirring in some turpentine to soften it up or at the very least give it a good stir to it's not too thick or stiff. Or you can make your own using a very soft microcrystalline wax and whiting. You may also try using mineral spirits or turps on your cloth to wipe off excess, just use a light hand. Hope that helps. Thank you for sharing, the results are beautiful! May I use this technique to hide an oily cup-stain on the surface of an oak buffet? The stain will not sand away and I imagine the ebony stain will hide it. No I am sorry, this is not a touch up kind of effect. You must start all the way at the wood and work up. Depending on how your piece is finished, it's possible to rub out stains or touch up the finish but if you don't have any practice doing this I strongly urge you to hire a professional furniture restorer to help. I hope you get to read this as it is a long way down. I have just purchased a corner eating nook. It is in a limed oak and has a glorious 'blond' finish which I love. However, the suite is second hand. The table top is worn and not in a shabby chic way. I am very hesitant to touch it though as I don't want to sand to the base and then be unable to match the existing and accompanying furniture. Do you or does ANYONE ELSE out there have any ideas to help me? I will put my email address here so that you can contact me direct. I can also download some photos too if that helps. Thankyou in advance. ps: we live in Sydney so the air is very humid - I don't know if that impacts on your suggestions. Email address is: peteandmel@australiamail.com Thankyou in advance! Hi. At some point it may need to be entirely refinished. If the surface is peeling or finish is missing, there really isn't any "touch up" or shortcut for it. An experienced restorer might be able to match the rest of your suite, but refinishing the entire suite will guarantee a beautiful matching and durable finish for a long time. Hi there! this is an amazing tutorial thank you! I was curious...can you ceruse other woods like OAK? I Have an Oak dining table that was treated with liming wax before I bought it. The finish looks great, but there are a few spots where candle wax was spilled on the table, and soaked into the grain. In the past, I've used an iron with brown bag material to pull out wax, but on the table with lime wax that may not be the best solution. Any ideas to repair the finish, or will I need to just refinish the entire top of the dining table? What will work for you depends a great deal on how it's finished and with what materials. Try a very small area with your heat technique tho, because that has worked for me. You may need to give the entire thing a new coat of wax when finished. This is such a great tutorial! Thank you for taking the time to document your process. I came across this in my search for how to create a limed/cerused finish, and hadn't previously heard of aniline dye. 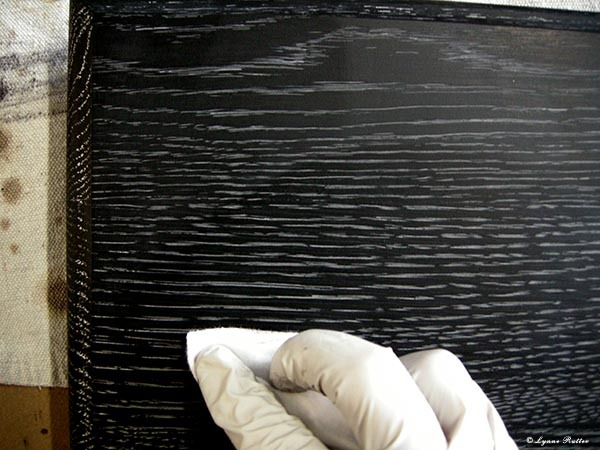 I've since placed an order for the Ebony Black and the Weathered Oak (water soluble) from J.E. Moser and am very excited! I have an oak credenza that I snagged off of Craigslist for far less than it is worth, I'm sure. 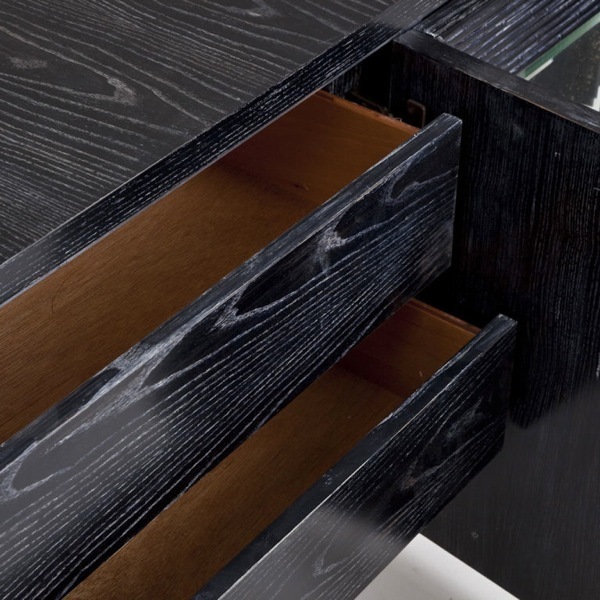 It has beautiful grain, even on the interior drawer fronts and adjustable shelves. I spent an entire weekend removing its glossy golden finish (very 50's/60's) with Citristrip, and now that I see just how beautiful the wood really is, I think liming is the best way to showcase it. The piece is all solid wood, however, the door fronts have a assymetrical grid pattern of burled oak veneer (which I discovered after stripping). I realize that I'm not going to get the same, big open pores here for a pronounced limed finish, but because they have so much interest on their own I'm less concerned about achieving major contrast. First, how to brush "with the grain" on burled wood, to open up what grain I can? Am I risking damaging the veneer by brushing? And lastly, can you lighten the Ebony Black color by simply mixing it with more water? I am aiming for more of a charcoal that will let some of the warmth of the natural wood color peek through. I also planned to try mixing it with a little of the Weathered Oak dye. I'm not familiar with the products you are mentioning here but I advise making samples before committing any of this to your treasured pieces! go buy some oak pieces and make samples! I'm wanting to use this technique for the top of a bar. I'm thinking of using oak plywood. Would this technique work? Also can I put shellac over the top of the wax for a stronger surface or it the wax durable enough? Oak plywood is just an oak veneer. Make samples to be sure it's thick enough to manage this. 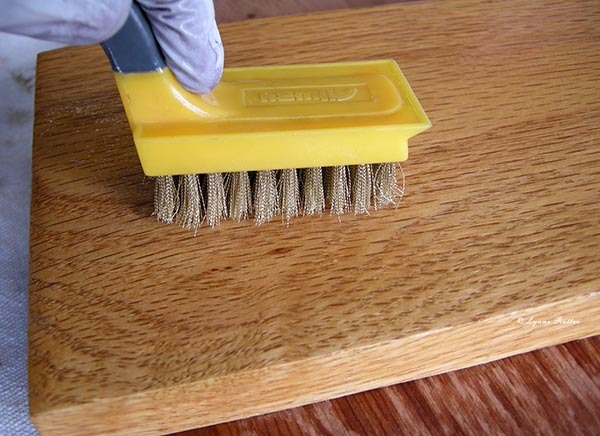 If we were to do this technique on unfinished oak cabinets(kitchen)would we still need to bristle brush it to raise the grain? They are currently not sanded very smooth. yes... If the grain is not raised enough there won't be any pattern to show. Don't worry it doesn't take very long. Practice on the inside of a cabinet door before you commit to this. Always make samples to check that your materials are working for you. Thanks for the instructions and the pictures. I love this technique and want to use it for a dining table, but like many others, am concerned with the durability of the wax finish. 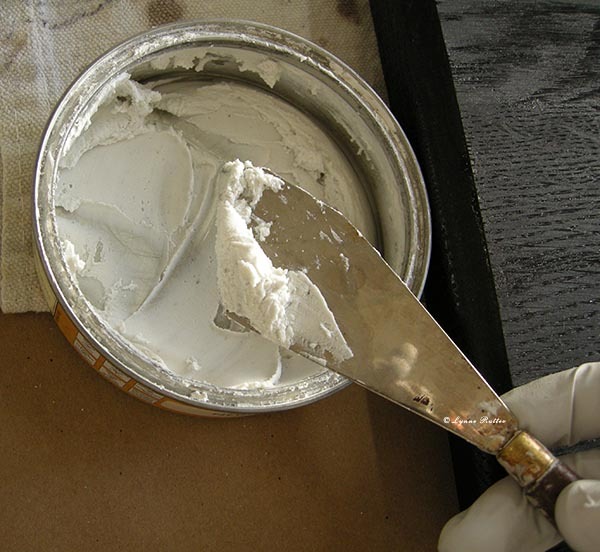 Have you had any experience doing this with white paint rather than liming wax? I have seen some describe their process as brushing the grain, staining/dying, wax-free shellac, latex primer paint, shellac, polyurethane for finish coat. Do you have any other recommendations? I have tried this technique and am having a hard time getting the white primer off the surface of the shellac. I wonder if it's because I only have one light coat on and the surface isn't "slick" enough to get the squeegee technique to work very well. Thoughts? Clear wax is a very good sealer and is easily maintained. You can re-wax the top from time to time with very little effort. If you want to use poly or something like it on your table then you should not use this method to ceruse the oak. The method I have demonstrated is traditional and easy. Using paint or primer(??) is going to be HARDER to do, and does not look as nice. Instead of primer you might consider using something that isn't designed to stick to everything, and dries slower. Possibly an oil-based paint or a slow-dry acrylic mixture would work better, but in those cases you will have to wait 30 days or whatever the cure time is, before varnishing. Then you have to wait for the varnish to cure (7+ days or more) before using the table. AND in my opinion an varnished table should STILL have a coat or two of wax on it, to make it easier to maintain. I am attempting this on shelves and running into a problem. The white from the wax I am using is making a grey finish over the black. I let the top coat dry overnight. I also used a regular wire brush, any chance that may have not opened the pores enough? Where did you purchase the wax and white powder pigment from? Hi Krystal A brass brush is necessary to pull out the grain--other metals might discolor the wood, or leave residue that can react or mix and change color. Or it's possible that your "topcoat" has not sealed the color of dye adequately or maybe you didn't let the dye dry long enough and it has moved. There are lot of ways this can go wrong and lots of options too (see the comments for more info!) All I can suggest is make samples to understand how your materials interact prior to attempting this finish on anything you care about.